LinkedIn articles vs posts – which is the most useful? However the answer is not as clear cut as that. Previously the LinkedIn publishing platform was called Pulse; when you wanted to publish something, you wrote a ‘post‘. And people then got confused thinking they were posting an update rather than writing an article. 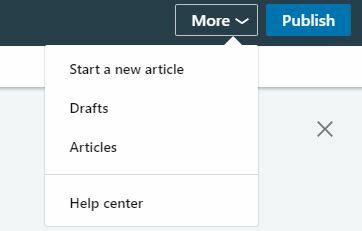 However recently LinkedIn cleared up the confusion and now you select the option to Write an article. Or if it’s a simple update you click in the box to Share an article, photo, video or idea. What is a LinkedIn article? A LinkedIn article is a like a blog post or magazine article. An article is your opportunity to showcase your expert authority or demonstrate your thought leadership. They are longer and more in-depth than LinkedIn posts. There is no specified word count or length, however LinkedIn studies suggest that the best received articles are longer than three paragraphs. I tend to advise my clients to aim for 700-900 words with longer articles from time to time e.g. 1500-2000 words. What is a LinkedIn post? A LinkedIn post or update allows you to share your professional expertise, experiences and anecdotes with your connections and the larger community. They are a quick way to stay in touch with you community and to update members on your current activity. The posts that you share are ‘broadcast’ to the newsfeed of your connections and will show up on their LinkedIn homepage. A post is limited to 1300 characters. The biggest difference between articles and posts is the formatting available when you select Write an article. Though not sophisticated, you can make the article easier to read and more visual, leading the reader through with headings, bold, italic, images and even video. Even better, you can save the article without publishing and come back to it later. 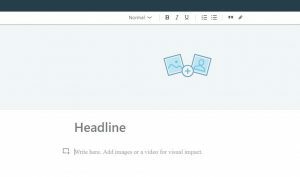 Click on More then Drafts to access your unpublished articles. Write about what you know best. That could include challenges you’ve faced, important trends in your sector, case studies of how you’ve helped a client, innovative approaches in your sector, controversial points of view and your insights on current news articles. to 20 might be harder. But don’t stop until you have 30 ideas or titles. Just keep going. Maybe not every idea will be the perfect idea however it gives you a good starting point. Who are the trend setters or big names in your sector and what are they writing about? What are the current ‘on trend’ topics? What gets you really angry? What articles already published are getting the most interest or comments? What are the frequently asked questions from your clients? What recent case studies or client successes can you discuss? Top 10 best tips to …. The 5 worst things you can do …. Who are you writing the article for? Although posts are shorter (1300 character limit) and arguably more ‘in the moment’, you still need to think about who you are writing it for, the purpose and what you want the reader to do next. The more engagement you get (on posts or articles), the more people will see your posts. Get engagement by asking questions, inviting comments or asking for recommendations. I generally recommend to my clients that they mix it up a bit – sharing posts and updates, but also writing articles that demonstrate their expert authority. Don’t get too hung up on the right number of words or making it perfect … the thing is to just get started. I always recommend consistency over frequency but at the end of the day, every sector and industry is different. Take that first step and write your first post or article and you’ll find out works best for your audience. We could talk about KPIs and measurements but I’ll leave that for a future post. In the meantime if you want to improve the way you use LinkedIn to promote your business, you’ll love my free 10 Day LinkedIn Challenge. Hi Sherry – this is very helpful. I had heard a little about posting content on LinkedIn but didn’t know the benefit. We have a very strong inbound content strategy, but we haven’t yet ventured into LinkedIn articles. A quick question about articles, does the content need to a full re-write of the original blog/article posted on our site, or can we re-purpose perhaps the opening paragraph fill with the original content and end with a link to the original article location? I look forward to getting your advice. What most SEO specialists seem to suggest is repurposing the opening paragraph and the final summary. That’s what works for me too. Hi Sherry, thanks it is helpful. Please advise whether it’s useful and well accepted to publish an article first and then post a link to it a few days ago. Yes some people do that. It will depend on who you’re aiming to reach. Experiment and see what works best for your audience.